What happens when you take three things you “hate” and put them together to make a meal? What are my hates? Well for this meal, they were pork, mango and cilantro. Mango is one of those things I really want to like. It’s so exotic. And pretty! But it has the strangest texture. And truthfully, I like the aftertaste better than the actual taste. Isn’t that weird? There are a few mango flavored things (ice cream) that I enjoy, but I seriously love fresh fruit. 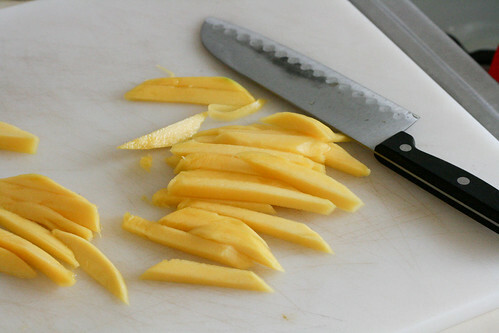 I would very much like to eat fresh mango the way my husband and son devour them. Cilantro. I can take it in very small doses. Or I can leave it out entirely, which is a better option. If it’s supposed to be the main source of flavor or “pop,” I generally sub in basil. This poses a problem for me because I love Indian food. And Indian cuisine uses a lot of cilantro. Basil is a good substitute most of the time, but not always. But it just looked so juicy! And fall-y apart-y. Did I mention delicious? And then I made the *mistake* of telling Nick about it. The next thing I knew we were at Costco putting a four pack of pork sirloin and a flat of mangos into our cart. A quick trip to Safeway led to a few sprigs of cilantro, and dinner was in business. I’ve been changed. I’ve been converted! Well, maybe. Converted to Andie’s Pulled Pork with Mango Slaw, anyway. This is so full of flavor, but it feels very light. It wasn’t at all greasy, but that was mostly due to the sirloin that we got. And the Mango Slaw is a must. Seriously, don’t leave it out. The pork is amazing on it’s own, but with this slaw? Just do it. 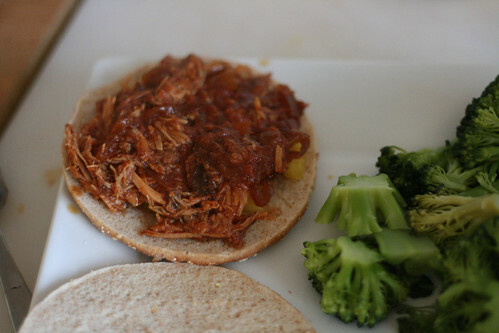 Place the onion in the slow cooker, followed by the pork. 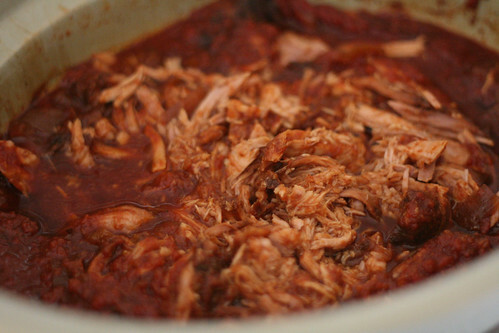 Combine the rest of the ingredients and pour over top of the pork. Cook on low for 8 hours. 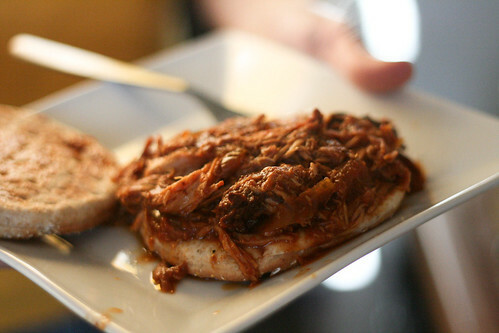 Before serving, use two forks to shred the pork. 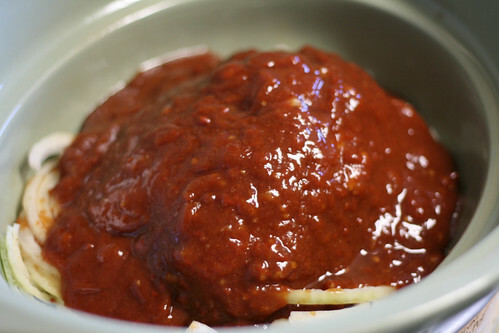 It will look like you have too much sauce before you shred it, but I promise you it will get absorbed and be amazing. 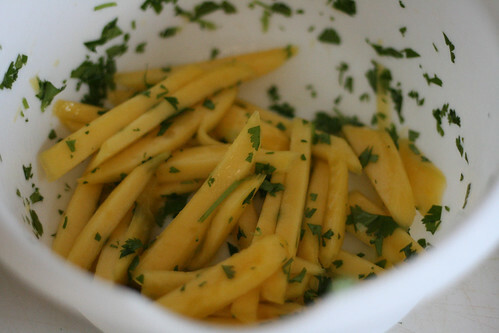 Combine the mango, lime juice and cilantro in a bowl. Keep covered in the refrigerator until ready to serve. Andie, for real, I would love to stay for dinner! Isn’t that funny? I never would have guessed that I’d like it so much!